ZY Optics has unveiled the new Mitakon Speedmaster 65mm f/1.4 lens for the Fujifilm G mount. It’s the fastest standard-length native lens available for Fujifilm’s GFX medium format mirrorless cameras. The manual-focus lens provides the rough equivalent of a 50mm field of view (in 35mm terms) when mounted on a GFX camera, and the fast f/1.4 aperture provides an ultra shallow depth of field and the ability to work in low-light environments. ZY Optics says the optical quality of the lens is designed to meet the demands of GFX sensors, which have resolutions starting at 51.4 megapixels in the GFX 50S and GFX 50R. There’s also a 102MP GFX camera on the horizon. Specs and features of the lens include 11 elements in 9 groups, a 9-blade rounded aperture, a metal lens body, and a built-in retractable lens hood. The Mitakon Speedmaster 65mm f/1.4 is available now through http://www.zyoptics.net/“>the company’s website and through authorized resellers with a price tag of $799. DJI has announced the new Osmo Pocket, the world’s smallest 3-axis stabilized camera designed for the masses. It’s small enough to fit in your pocket while still shooting high-quality photos and videos. Despite measuring roughly 4 inches tall, the Osmo Pocket contains a 1/2.3-inch sensor that captures 12-megapixel photos and 4K videos at up to 60fps and 100Mbps. The state-of-the-art three-axis mechanical gimbal on the camera helps you capture sharp photos and smooth videos by compensating for shake and movement. Under the Osmo Pocket is a universal port that allows the camera to be paired with mobile devices that use Apple’s Lightning or USB-C connections. Paired devices can be used as a monitor for the camera. Other features include dual microphones, advanced noise-canceling, up to two hours of battery life while shooting 4K/30fps, ActiveTrack subject tracking, FaceTrack face tracking, Timelapse, Motionlapse, FPV Mode (capturing your view instead of a level horizon), 3×3 panoramas with 9 photos, and 180° panoramas. One immediately obvious use for this tiny high-res camera would be vlogging, an industry that’s exploding in popularity. The DJI Osmo Pocket will start shipping on December 15th, 2018, and it has a price tag of $349. The photography apparel and accessory company COOPH has announced a new photo vest for feature- and fashion-conscious photographers. It’s a high-tech reinvention of the classic photo vest that has built-in heating. The Heatable Photo Vest is what the company came up with. 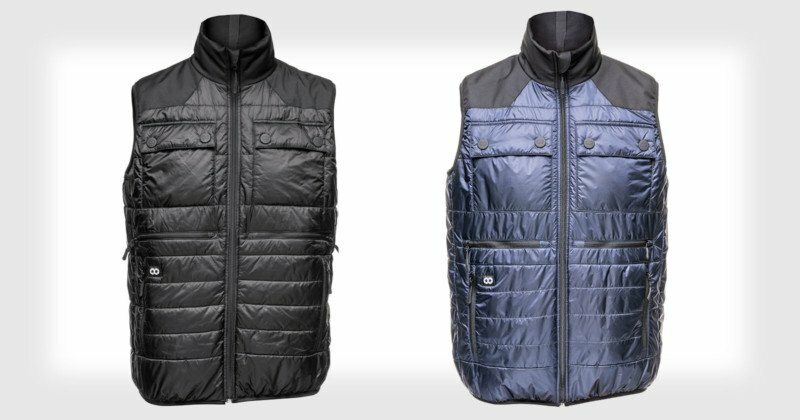 Made in Poland, the reversible vest is ultra-lightweight and can fold up compactly when not being worn. Put it on, and sheep wool insulation keeps you warm. If you need some active heating, the built-in THERM-IC heating system can warm your hand pockets as well as the kidney, back, and stomach areas of the vest — the companion COOPH 5200mAh battery provides 5 hours of heating, but the vest is compatible with any rechargeable 5V power bank that uses a USB connection. To control the heat, you can also pair a smartphone to the vest using the THERM-IC Bluetooth dongle and the free THERM-IC app for iOS and Android. In addition to controlling the temperature, the smartphone app can also automatically adjust the temperature as you move around. As a good photo vest should, the COOPH Heatable Photo Vest provides a number of pockets and storage options for carrying your camera gear, accessories, and other small items. The reversible vest has a different styling on the reverse side. The COOPH Heatable Photo Vest is now available in black or navy with a hefty price tag of €389, or about $440, for the complete package. You can also purchase the vest by itself for €299 ($340) without the €39 ($44) power bank and €69 ($78) Bluetooth dongle. Canon is reportedly planning to launch an high-resolution EOS R full-frame mirrorless camera with at least 75 megapixels. While the timeframe for launch isn’t clear (and is likely far from being decided internally at Canon), the camera could show up in the second half of 2019. “One source added that the high megapixel EOS R will come once 4 or 5 more native RF mount lenses are announced, with one of the new lenses being ‘the best landscape lens in the Canon lineup,’” Canon Rumors writes. What’s more, the sources are confirming speculation that Canon isn’t planning to replace the 50-megapixel EOS 5DS and 5DS R with new high-megapixel DSLRs but will instead be turning its high-megapixel camera efforts toward the new EOS R line. Canon has long been reported to have more than one full-frame mirrorless camera in development, and the $2,299, 30MP EOS R announced in September 2018 isn’t considered to be the company’s pro-grade flagship full-frame mirrorless camera. This rumored 75-megapixel EOS R camera would more closely fit the bill, but Canon Rumors is also hearing that the next EOS R camera to be announced in 2019 may be an even lower tier “entry level” mirrorless camera, so professional Canon shooters may have to wait a bit for this high-res camera to appear. Peak Design is probably the most well-known camera bag brand to leverage Kickstarter to launch their products, going way back as early as 2014 with their camera straps. And since then, there have been many camera bags brands who have tried to follow their footsteps — some successfully, and some not. So when Xennec approached me to review their new range of camera bags, I was slightly apprehensive when I learned that it was to be launched via Kickstarter. There were just too many “all-talk and no go” products and vaporware around (Yashica Y35 anyone? ), and I didn’t want to be associated with such campaigns. To their credit, Xennec stepped up to address the concerns, providing background information on the project and team which included a prominent retailer in Singapore and a product designer with a track record in designing camera bags. They also provided for review a pre-production model of their bag, which is very close to production quality. So today, we’re looking at the Xennec CityScape BackPack 15 in black trim. The bag is also available in Charcoal trim, which looks pretty sharp and dapper. Right off the bat, the backpack is a winner design wise, delivering a camera bag that is versatile enough to be used for both outdoor shoots and corporate shoots. Measuring 18 x 17.3 x 5.5 inches (44 x 30 x 14 cm), the backpack fits within most cabin carry-on size restrictions, making it ideal for air travel. It weighs in at just 3.32 lbs (1.51kg) and swallows up to 20 liters of camera gear. The Xennec CityScape BackPack 15 features a sturdy framework all around, holding its form even when fully loaded. The high-density foam padding cushions the contents from impact from all sides without adding unnecessary bulk or weight. A well-padded handle for the top integrates neatly into the backpack, making it easy to pick up and go. At the front sits two zippered compartments, of which you can organize your batteries and memory cards in the smaller one at the bottom in its sewn internal pockets. The larger front compartment fits my 9.7” iPad easily, and the specs indicate that it’ll take up to a 12” tablet. There is also another compartment in the front flap which you can fit a 15” notebook or documents, in which my 15” MacBook Pro slipped in easily. The zippers are high in quality and offer smooth operation, and they are lined with rubberized flaps to keep water out. Flipping the Xennec CityScape BackPack 15 around, the generously padded shoulder straps with ergonomically designed curve makes it easy and comfortable to carry the backpack around. Even when fully loaded, the backpack is comfortable to carry and conforms to my back easily. I brought it out for a short hike and the shoulder straps did a phenomenal job of distributing the weight of the bag without any discomfort. I like that the sternum strap is fastened magnetic latches that are secure and fast to use, as opposed to the traditional clips which can be finicky to operate with gloves. The strap also incorporates a slight elastic action which makes it really comfortable yet secure. There is also a removable waist belt which I didn’t try out. The back of the backpack is padded with breathable fabric, so sweat and moisture get wicked away and evaporates quickly. The backpack features a loop for luggage handle pass-through, making it more convenient to move around with your luggage at the airport for example. At the sides are magnetic pockets, one for carrying a tripod/monopod, and the other to fit your water bottle. The pockets are nicely designed with the proper size and depth, making it easy to secure and remove the tripod or water bottle. They snap back snugly with their magnetic buttons – a far more elegant solution than webbed pockets which tend to loosen after a while. The bottom of the backpack is coated with what Xennec calls “carbonate-coated fabric” for water resistance. The access to the main compartment of the backpack is via the back, so it will be difficult for any potential thieves to help themselves to your gear while you’re carrying the Xennec CityScape backpack. Of notable mention is the twist lock zipper tabs Xennec calls Twiz-Lock, which requires you to twist the tabs in opposite angles to lock or unlock the tabs. This feature makes it more difficult for someone to access your gear quickly and adding to the security of the bag. The cover unzips on 3 sides and opens completely, and the shoulder straps fold back completely to stay out of the way for easy access. The quality construction continues inside with high-density foam forming the inside dividers to provide rigid and lightweight protection for your gear. There are sufficient dividers to create multiple configurations for almost any arrangement you need. I managed to fit an impressive amount of my Canon EOS gear inside the backpack, which fits over my LowePro roller case containing my Profoto lighting equipment, making it easy to transport all my gear for commercial assignments. The Xennec CityScape 15 is great for DSLR, medium format gear or full frame mirrorless systems. If you’re shooting with Micro Four Thirds or a rangefinder with smaller lenses, the dividers can be too large to fit smaller items snugly. The rain cover sits in a blue poach ready for deployment when required (provided you remember to pack it in), and there are two zippered pockets on the inside with see-through fabric for your important documents such as passports and travel documents. All in all, the Xennec CityScape 15 is a surprisingly capable backpack for any photographers wishing to carry a load of gear for urban or light rural location shooting. The backpack’s svelte appearance belies its carrying capacity of 20 liters, and it feels very well-built and comfortable even when fully loaded. I’d certainly recommend that you check out the CityScape 15 and the other two Xennec camera bags at their Kickstarter campaign page (check out the campaign for the pricing). Full disclosure: A pre-production backpack was provided by Xennec for the purpose of this review. About the author: Nelson Tan is a Singapore-based photographer and instructor. Visit his photo blog, Facebook, and his photo gallery. Think modern day Photoshop beauty retouching is impressive? In the future, your professional-grade camera might be able to retouch subjects for you in real-time. Here’s a 30-second video that shows this technology in action. The demo shows a woman in the frame with eye and cheek adjustment sliders available. After significantly reducing the size of her lower jaw, the woman moves and looks around to show how well the real-time retouching can track her. This video was shared by Jason Zhang, the founder of the Z CAM line of cameras. Based out of Shenzhen, China, Z CAM’s E1 became the world’s smallest Micro Four Thirds interchangeable lens mount 4K camera when it was launched in 2015. “Yes, this is the new virtual reality,” Zhang writes. Google Pixel 3 smartphone has a Night Sight feature that uses AI to capture “mind-blowing” photos in near darkness. Photographer Pierre T. Lambert wanted to see how the tech stacks up against a pro-grade camera, so he did a low-light shootout pitting it against the Sony a7R III. The Google Pixel 3 starts at $799 and the Sony a7R III is ordinarily priced at $3,200 for just the camera body. Lambert shot RAW on the a7R III to match white balance with the Pixel 3. And the shutter speed Lambert discusses is the exposure time of each of the 6 shots captured and combined by the Night Sight mode. Lambert says that while he was blown away by the Pixel 3’s results, he isn’t trying to say that smartphones will be replacing standalone cameras anytime soon. “I’m trying to tell you that the technology that’s getting built into your phone right now is so freaking powerful that I think the day it comes into big cameras it might become absolutely mind-blowing,” Lambert says. Nikon’s new full-frame mirrorless Z lens mount is designed to be futureproof over the next 100 years and “redefine possibilities.” How crazy are the possibilities? Get this: the Z-mount could theoretically accept lenses with apertures as large as f/0.65. The French photo blog Mizuwari published an interview with Nikon France marketing director Nicolas Gillet regarding the Nikon Z series. Gillet states that the main limitation of the Nikon F mount is that it can’t physically support autofocus lenses faster than f/1.4. The new Z mount shatters that barrier, as evidenced by the upcoming Nikon 58mm f/0.95 Noct Z-mount lens. Nikon has also patented a 52mm f/0.9 lens. But how fast could the system’s lenses theoretically be? “For the record, Nikon’s optical engineers have calculated that the Z mount can accept lenses up to f/0.65,” Gillet reveals. Again, this is what’s theoretically possible and not what’s actually probable in the Z mount’s future. The Nikon 58mm f/0.95 already has a razor-thin depth-of-field of about a fingernail’s length when shooting head and shoulder portraits, so one can only imagine how impossible it would be to shoot an f/0.65 lens wide open. And the size and weight of an f/0.65 lens would be the antithesis of the portability promised by mirrorless cameras. Instagram is rolling out a redesign to its profile view. The goal is to make it “easier and cleaner to use,” but the new look will also deemphasize follower counts. “Your profile is where you share who you are on Instagram, so starting today we’re testing ways you can better express yourself and more easily connect with the people you care about on your profile,” Instagram writes. Instagram is also removing users’ post counts that were previously found alongside follower counts. And instead of follower counts being found in prominent screen real estate at the very top, they’re being moved into a single line below the username, profile pic, and bio. What the Instagram profile view currently looks like. An example of what the new view being rolled out may look like. The redesign will be tested in various combinations among Instagram users in the coming weeks as the fresh look is being rolled out, and the company says it will continue to experiment and update things based on user feedback. These latest changes are coming just days after Instagram announced the deployment of a new AI system that will automatically hunt down and delete fake followers, likes, and comments throughout the photo-sharing social network.